Markelle Fultz remains a mystery for the future. On draft night in the 76ers' war room, according to those familiar with what transpired, the drumbeat of the evening was all about finding a "third star" for the roster, a player with the potential to complement Joel Embiid and Ben Simmons and elevate the team to an elite status. Whether that is a real necessity in the modern NBA or simply a copycat of what has won championships recently is beside the point. Could you win a title with two transcendent stars and a very talented cast of role players? Sure, but with two stars in hand, why not reach for a third? That is why the team traded Mikal Bridges, the safe and smart pick who will become one of those essential role players, in favor of Zhaire Smith, whose athletic upside is truly without a ceiling. If he reaches that ceiling is another matter – no guarantees there – but the team decided Smith represented the best hope for that in the draft. Getting a future first-round pick in the deal was a bonus, but, later narrative aside, it wasn't what swung things. It will be a good while before the wisdom of that move, and its true authorship, is known, but the point of the story is that the Sixers were very sure they needed to get a third star because they were also very sure they didn't already have one. And if you need to ask yourself how the organization really feels, deep down, about Markelle Fultz, please refer to that for your answer. Markelle Fultz spent most of last season on the sidelines, appearing in just 14 regular-season games. As June has given way to October, not much has happened to change that opinion. 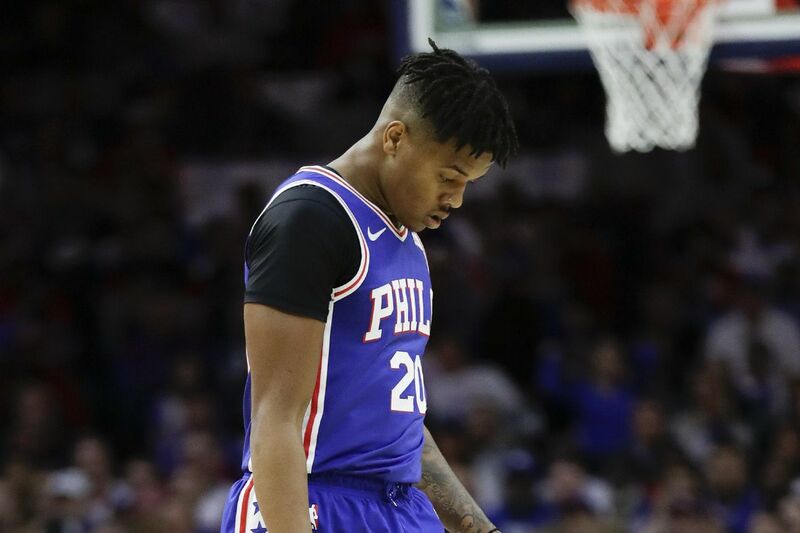 Fultz took those 160,000 shots in the gym with his shooting coach, and he allegedly shook the yips that followed his shoulder condition of the year before. Taking shots is a lot different from making them, of course. My mailman can take 160,000 jump shots, but that isn't going to transform him into an NBA shooting guard. Fultz, who has been remarkably placid during the whole ordeal, emerged from the summer as pretty much the same guy who entered it. His long-range (and medium-range) shooting is still unreliable, his stroke is laborious, and yet, man, this guy is a basketball player. What he isn't, however, is a shooting guard. He is a point guard, and, ouchy back aside, the Sixers already have one of those. Unless the Sixers throw every previous plan into the air, Simmons will be at the point for 35 minutes a game for the next decade. He could be converted into a slashing forward, but, like Fultz, Simmons operates far better with the ball than waiting for it. And, let's face it, there is no reason to mess with Ben Simmons. Even with his limitations, he's just fine. So, assuming that another former No. 1 pick in the draft should be expected to also play 35 or so minutes a game, that means the optimal plan for Fultz is to play on the ball for the 13 minutes when Simmons is resting, and then play the other 22 minutes somewhere else. Yeah, like where? Let's acknowledge that three games are a short sample, and that things can change, but let's also acknowledge that this isn't going very well. When Simmons and Fultz are on the court together, Simmons does what he does and Fultz floats aimlessly around the perimeter by himself. He is by himself because there is no need to defend him there. Armed with that knowledge, opponents will collapse their defenses and limit the space for Simmons and Embiid to maneuver closer to the basket. In that regard, Fultz doesn't just add little to the offense, but he also subtracts from it. Coach Brett Brown predicted that pain would accompany the experiment of Simmons and Fultz together on the court, but he said he would commit to it for an "appropriate" time. Brown has so far steered the team through an unusual competitive tack, using the first half as a lesson period for Fultz and the second half to actually try to win the game. Unless Fultz develops quickly into a perimeter threat, it's hard to see how Brown can keep that up. The plan, as laid out before the season opened, was to have this operation working smoothly by the playoffs and then – shazam! – the Sixers would be capable, in Brown's estimation, of reaching and winning the Eastern Conference championship. There are two problems with that. (There are actually more, but space is tight.) The first is whether Fultz can reach the place where he warrants those 22 minutes without the ball. The second is that the experiment might not result in 50 or more wins this time around. Getting deep in the postseason from the wrong side of the playoff bracket is a difficult challenge. Looking at this pragmatically, I believe there are teams out there that need a point guard and would make good use of Fultz. I also believe one of them is going to get him eventually when the experiment is over. The Sixers can't hit fast-forward on the situation, however. It would be really embarrassing for one thing, and Fultz's value on the open market isn't all that high. So, they will plug on. Brown will continue to speak optimistically and coach pessimistically. He has experience with that. It's not the fault of Markelle Fultz that he is exclusively a point guard or that he was drafted by a team for which that position was already filled. Instead, he was supposed to somehow morph into the "third star." The Sixers have made it clear they no longer expect that to happen. They just haven't said it out loud yet.